A friend recently sent me a link to a host of cool pet products. Scanning them, I stopped cold when I saw the Latch’NVent. Excitement building, I went to the company’s website. It was the product I had been in search of for the past decade. I live with four rescue cats, three of whom are long-haired. All of them like to nap in dark, out-of-the-way places, such as my closet. I never leave the house without cat hair somewhere on my clothes, but I draw the line at wearing an item that is literally coated with it. I had to somehow keep my cats out of my closet while at the same time keeping the door ajar so as to let the tiny room and its contents breathe. I say, who wants their clothes to smell like stinky shoes and dirty laundry? Over the years I’d ad-libbed temporary fix-its while searching hardware stores for a solution. Most recently I’d been using a rubber bumper at the top and a cute Scottie doorstop at the bottom, requiring me to bend over each time I wanted to enter the closet and again upon exiting. While this helped add some much-needed exercise to my day, it was an absolute bother. Now perhaps the answer was finally at hand. I liked what I read about Latch’NVent online. It is high-impact plastic, and appears sturdy. 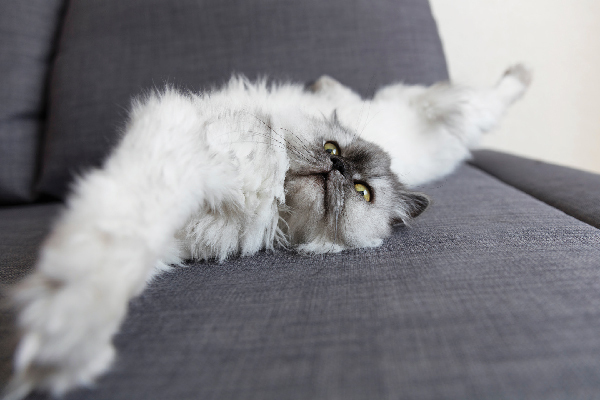 The product comes with three extensions (2 inches, 3 inches and 4 inches), which I realized would solve my second problem — that of keeping the bedroom door locked into a semi-open position at night so my cats could come and go but still keep my Scottish Terrier in the room with me. I was going to have to order two. Sad to say, the item was out of stock; either it was immensely popular or just the opposite and off the market. I fired off an email to the company immediately asking when it would be available, and received a response within a couple of hours. “One to two months,” was the answer, but they could spare one now if I was interested. I jumped at the offer and sent them my mailing address. The contents and directions looked easy enough, so I ran for my tools and got started. 12:20 p.m.: Removed the existing striker plate with a Philips screwdriver. 12:22 p.m.: Trimmed the tabs on the new Latch’NVent striker plate to fit and screwed it into position using existing holes. 12:27 p.m.: Drilled hole to secure outer section to doorframe and screwed into place. 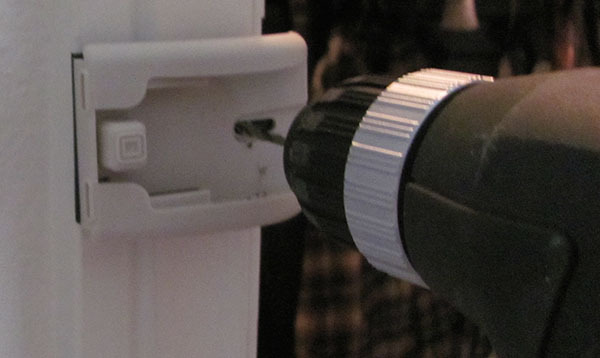 12:29 p.m.: Installed 2-inch extension by simply sliding it into the channel until it snapped into place. 12:30 p.m.: Shut door. It latched in place just as advertised and is exactly what I wanted! Whooo-hooo — and it only took 15 minutes to install (plus another 5 for photos)! With a simple push of a button, I can easily switch extensions to adjust the opening size or to remove it to shut and latch the door normally. I did find that I needed to tighten the screws in the striker plate a bit more so the door would shut completely and not hang up. (The instructions cautioned, “Do not over tighten,” so I didn’t.) I will probably never shut the closet door all the way, but it’s nice to have that option. 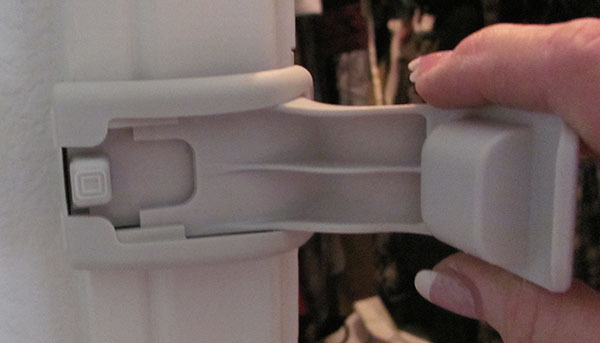 I’d happily been using the closet Latch’NVent for about a month before I was able to get my hands on another one. This one I installed on the bedroom door jam using the 4-inch extension. I pop the extension out during the day and back in each night so as not to snap it off accidentally when walking by. (One of my nicknames in college was Klutz, so you get the picture.) It takes but a second and is much easier than dealing with the similar temporary wedge-and-doorstop I’d been using. For those of you with hefty kitties, I can tell you that my four run about 12 pounds each, except for Tweety, a Manx. At 14 pounds, she is short-bodied and round but she has no problem with the 4 1/4-inch opening created by the 4-inch extension. It actually holds the door open wider than it had been wedged at before. 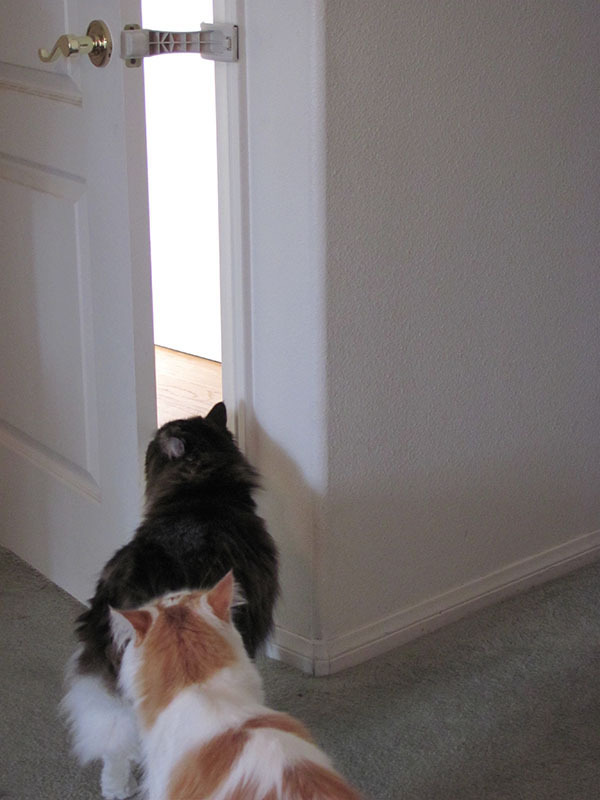 This should cut down on the black smudge mark buildup on the doorjamb as cats go in and out — another bonus. Kerry Swink, inventor and company owner, shared a story with me. 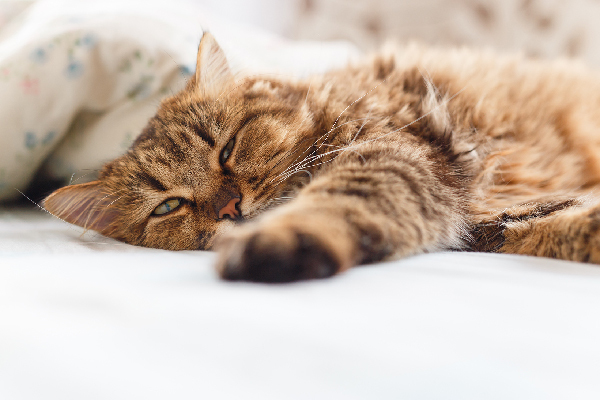 A satisfied customer wrote to him about her senior cat who wasn’t getting her blood pressure and liver meds because the dog kept eating the dosed food. 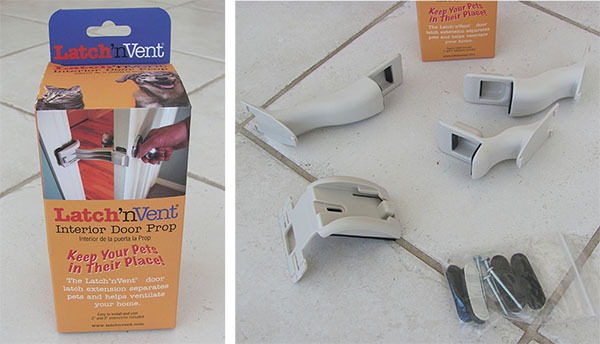 Latch’NVent solved the problem and likely saved both the cat and the dog. I’m already wondering what other doors in my house need one of these. I love the room ventilation aspect of the product. Even though I live in California, I do not have air conditioning. When it gets hot for an extended period of time, I try to capture as much cool night air as possible, after the sun goes down and before retiring for bed. Simply propping an outside door open is not an option as my Scottie is a runner given the chance, and my cats are indoor-only. 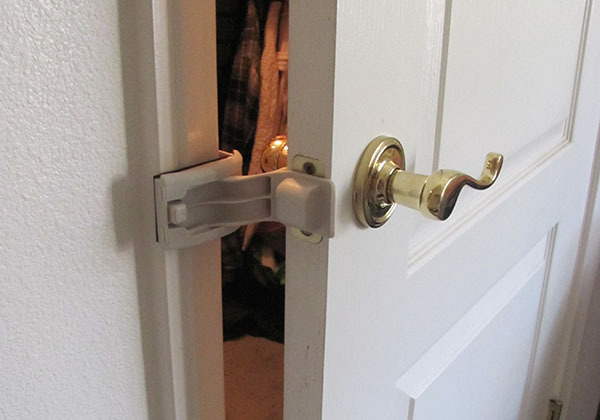 A Latch’NVent on my kitchen/garage door in the summer would create a nice draft, which would really help with evening airflow yet keep my fur kids inside. I just love sharing cool products with the pet world when they work for me. Oh! And the Latch’NVent price is an affordable $19.99. I hope you find your own uses for this award-winning gadget. 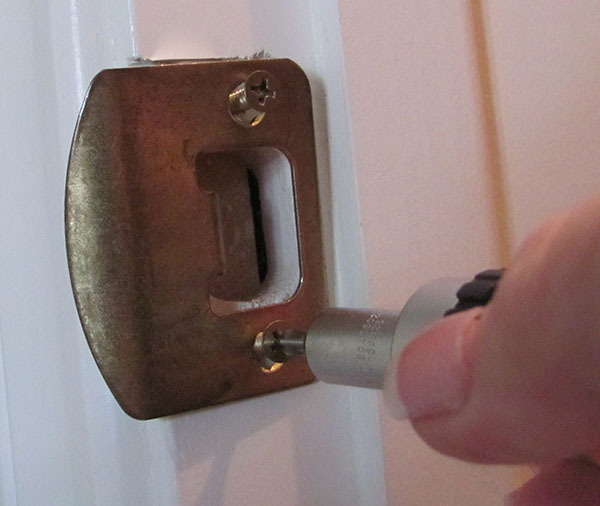 Could you use a Latch’NVent in your home? We have three to give away! Follow the directions below for a chance to win. Create a Disqus account, if you haven’t already, and include a valid email. 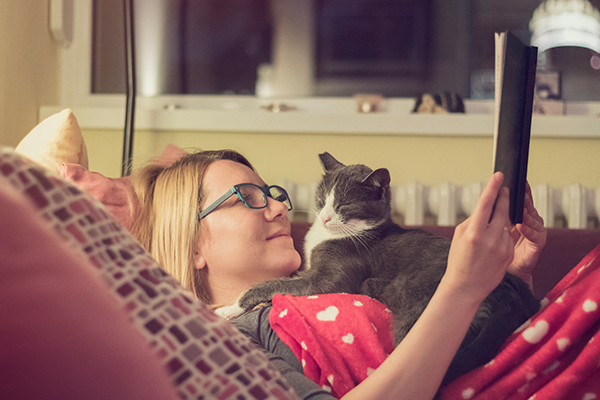 It takes just a minute and allows you to better participate in Catster’s community of people who are passionate about dogs. If you already have a Disqus account, check it to ensure the account includes a valid email. Comment below using your Disqus account, telling us how this product would help in your home. Our favorite comment wins. You must be a resident of the U.S. to score this prize. Check your email for a “You’ve Won!” message from us after noon PST on Thursday, Feb. 19. We’ll give the winner two days to respond before moving on to our next favorite. About the author: Marci Kladnik, her four rescue cats, and one Scottish Terrier live in a small town with no stoplights or mail delivery. A retired graphic designer and technical writer, she designed and wrote for two publishers and two medical device manufacturers. She was also on the masthead of the monthly National Model Railroad Association Bulletin. 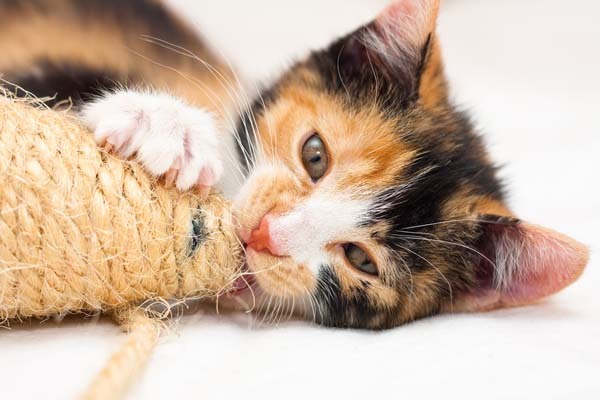 Her award-winning, bi-weekly cat column ran for seven years in three newspapers, and she is a contributing writer for Catster.com, an award-winning photographer, and president of the Cat Writers’ Association. Involved in TNR and feral rescue, she sat on the board of directors of Catalyst for Cats from 2007 to 2013 and in her spare time, trapped and fostered local feral cats and kittens. Past columns appear on catalystforcats.org and her dog blogs at maggiestories.com.